The Nihon Ki-in (Japan Go Association) Numazu Branch (Branch Manager: Mr. Suganuma Takeshi), whose office is located at Jowa Gorakukan Go Salon in Kozuwa, held the Citizen Go Tournament at Numazu Labor Administration Building in Takashima Honcho city on July 30th. The tournament was a part of Numazu Summer Festival. Sixteen teams competed, and Susono Go Lovers’ Club Team C won the championship. Its organizers have been intending to use Numazu, as the birthplace of Honinbo Jowa (the twelfth Honinbo) who was a Go player from Izu-Kisho (Nishiura) in the Edo period, to attract people’s attention and to popularize Go. They called for Go clubs to participate, resulting in a number of teams—whose members range from grade-schoolers to the elderly—vying in the four-round tournament for the glory of victory. Besides, there were Go professionals invited from Nihon Ki-in: Mr. Komatsu Hideki 9p, Mrs. Komatsu Hideko 4p, and also an instructor from the branch, Mr. Sato Koya (Higashimakado), who had been the first runner-up in a national competition for the Japanese Amateur Honinbo title. In addition, in remembrance of Jowa’s two hundred and thirtieth birthday, the branch is planning to build a stone monument—”The Birthplace of Honinbo Jowa, the Twelfth Honinbo”—at Kisho, his hometown. They are currently making serious efforts with fundraising activities for its construction. The Honinbo title dates back four centuries, from the era of Honinbo Sansa, the first Honinbo and Meijin who was a Go teacher of Oda Nobunaga, Toyotomi Hideyoshi, Tokugawa Ieyasu, and other Japan leaders, to that of Honinbo Mon’yu, the twenty-sixth Honinbo (Honinbo Iyama Yuta). Honinbo Jowa, the twelfth Honinbo, was called “Gosei” or “Go Master” as a great Meijin, and he was given the name alongside Honinbo Dosaku, the fourth Honinbo, who was active during the early Edo era. Dosaku was called The Former Master, and Jowa The Latter Master. Jowa’s birthplace is shrouded in mystery, in part because Jowa himself did not say anything about it. There are various theories: the Born in Kisho Theory is told by local people, but the Born in Shinshu Theory is generally regarded as more plausible. Because of the work “A Study on Honinbo Jowa’s Birthplace”, into which Osawa Nagahiro, a play history researcher, has collected his research results in 1984, people view the Born in Numazu Theory as the ironclad one, and printed matter since then has changed to favor it. The branch decided to build the stone monument this year, and, with understanding and cooperation from the Kadonos, whose family Jowa was born into, they are planning to build it near the Kisho West Gate bus stop. The fundraising activities has begun in April and, so far, collected around half a million yen. However, Mr. Suganuma, the Branch Manager, said that “There’s not enough power here at Numazu Branch. 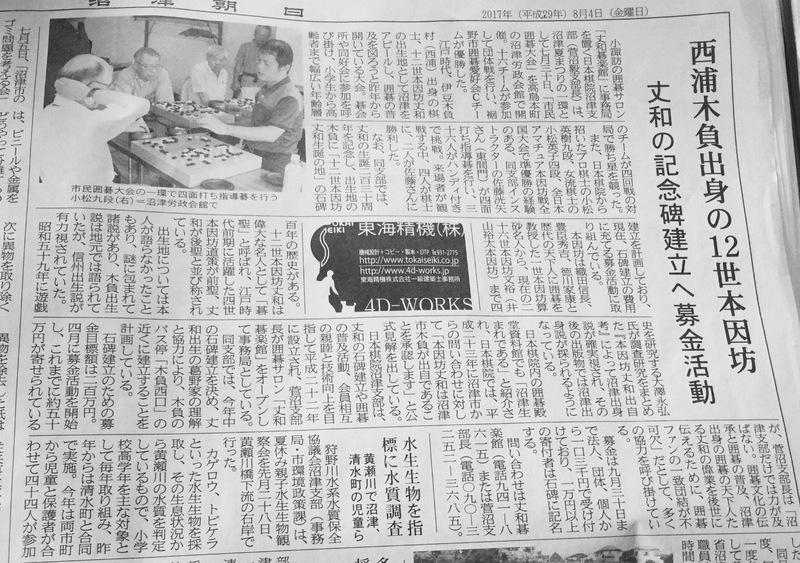 To pass down the Go culture, to popularize Go, and to hand down the masterpieces of Jowa, who is the top among the cream of Go players and who came from Numazu, to the generations to come, the unity of Go lovers is indispensable.” And he is calling for a lot of cooperation. The fundraising accepts donations in multiples of three thousand yen—from legal people, groups, and people—until September 30th. Those donating at least ten thousand yen will have their names inscribed on the stone monument. For enquiries, please contact Jowa Gorakukan (Tel. 941-8615) or Mr. Suganuma, the Branch Manager (Tel. 090-3252-3685).